Handblown glass flasks of the nineteenth century are distinctively American forms. Originally intended as containers to hold distilled spirits, they also were used for a few other liquid products such as medicines and bitters. Unlike today, distillers did not bottle their own spirits. Instead merchants, druggists, tavern keepers, and other vendors would fill glass containers from distillery casks for sale to customers, who could get these bottles refilled at the same place. and seldom were discarded unless broken, so many still survive. As mentioned in our earlier blog, from 1850 to 1901 at least seven glass factories operated in Louisville and two others just across the Ohio River in New Albany, Indiana. Several were known by more than one business name over the years, and many glassblowers in the Louisville factories also were involved at various times with those in New Albany. The earliest known evidence of glass manufacturing in Louisville is the formation of the original Kentucky Glass Works (1850-circa 1855), which in later years became more commonly known as the Louisville Glass Works (circa 1855-1873). The 1850 Census recorded a total of 50 workers employed there, 21 of them glassblowers. The sand used for making the glass was from nearby Elizabethtown in Hardin County, Kentucky, as reported in the February 3, 1866, issue of the Louisville Industrial & Commercial Gazette. Kentucky (later Louisville) Glass Works manufactured bottles, jars, tumblers, and similar functional containers, as well as other handblown glass items in the “South Jersey” style. (The New Jersey connection was also discussed in our earlier blog.) In fact, one of the later investors, Dr. John. A. Krack, owned a local pharmacy and purchased an interest in the glassworks in 1856 to help supply bottles for his druggist business. (He remained a part-owner until at least 1871.) 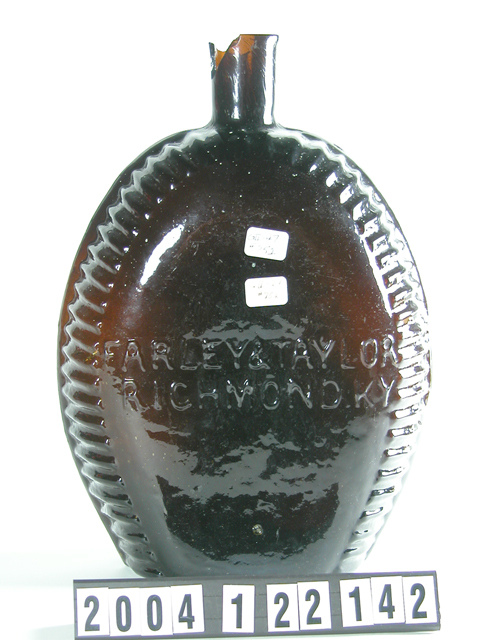 The original Kentucky Glass Works did not mark any bottles with their factory name or initials. Several of the unmarked eagle flasks and the similarly shaped flask marked “FARLEY & TAYLOR / RICHMOND KY” were probably made here in the early 1850s. 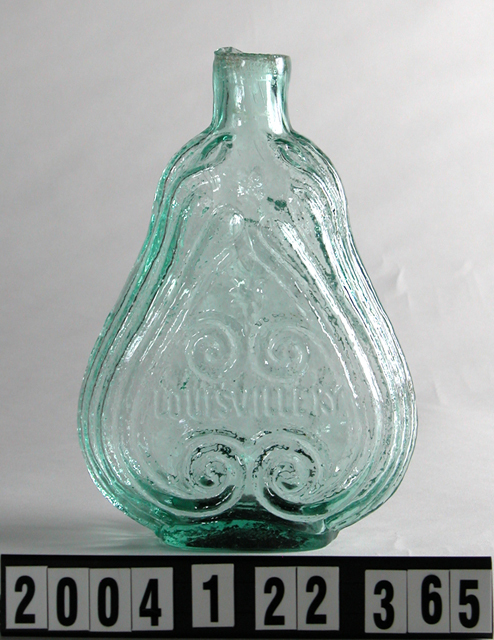 Louisville Glass Works became well known for the popular “scroll” (or “violin”), “double eagle”, and “ribbed” flasks; these are typically marked “LOUISVILLE KY / GLASSWORKS”. Their wide range of colors indicates that these were produced in quantity, and over fairly long periods of time. Louisville Glass Works closed permanently by 1873, evidently as a result of the recession of that year, and never reopened. The invention of the automatic bottle machine in 1903 eventually put glassblowers out of work forever. Also in 1903, Emil and Tony Stanger helped make the largest glass bottle ever blown, at “108 GAL”, in Millville, New Jersey, later exhibited at the 1904 St. Louis World’s Fair. (It was dethroned in 1992 during Millville’s “Glass Blast Weekend”.) The actual site of the original Kentucky Glass Works factory, razed three or four times since the 1870s, is almost directly across the street, and slightly south of, Louisville’s “Extreme Park” built in 2001.